In Supremacy 1914 managing, upgrading and conquering provinces will lead you to victory. Provinces determine the expansion of your nation, are the main sites of production and the scene for great battles. In order to maximize your efficiency you will have to keep a close eye on your provinces' production and morale. The province bar on the bottom of the screen informs you about all relevant properties of the currently selected own (or enemy) province. This information includes the province's owner, the current morale of its population, the resources and tax income from that province, all buildings in that province as well as current constructions and productions. The main menu provides access to the province administration, which offers an overview over all your provinces, buildings and constructions. 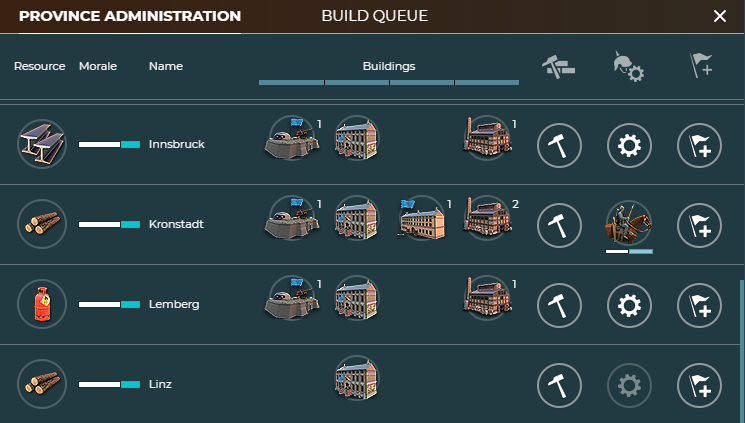 Here you can also start production and constructions (in one or multiple provinces at a time), enable and disable buildings and set rally points (see chapter 5 "Warfare"). Disabling/enabling buildings: It will often make sense to disable unused buildings to save their upkeep costs. To switch buildings on or off click on the building icon in the province bar or province administration. Start production/construction: Start productions and constructions by clicking on the hammer or cogwheel icon in the province bar or province administration. Province morale overview: The province administration gives you a quick overview of your province's morale. Low morale can have a number of negative effects on your provinces' buildings and productions. The higher the distance to your country's capital, the lower your maximum province morale. If there are enemy troops on your territory it will lower your maximum province morale. Some buildings (e.g. railways, factories, harbors) increase your maximum province morale. Each country you are at war with will lower your maximum province morale. Morale trends in neighboring provinces increase or lower your maximum province morale. The more enemy provinces surround your province, the lower its maximum province morale. If there is a shortage of certain resources in your overall economy provice morale will suffer (see chapter 4 "Economy"). Dependent on these factors your province moral will show a trend ("rising" or "falling"). If your maximum province morale is above the province's current morale, it will increase at day change by 20-25% of the difference between both values. If your maximum province morale is below the province's current morale, it will decrease accordingly. As mentioned, the morale of a province directly effects the province's resource production. If morale is low, the province will just produce a fraction of the possible resources: One single-resource province with at least 90% morale produces 3,150 tons a day. If morale drops under 90%, the production fades continuously and is reduced to half when the morale drops to 30%, below that it keeps decreasing even further. In addition, provinces with low morale (less than 30%) have a high risk of revolts. Revolts damage or kill garrison troops or change the owner of a province. You can prevent revolting by positioning a sufficient number of garrison troops in the province center. Revolt risk is displayed in morale tooltip of the province bar. Hint: If you find your province morale dropping for no apparent reason, a hostile spy might be the cause. He may have either reduced the morale directly or may have sabotaged the production of resources, which causes a drop of morale if the demand cannot be met anymore (see "Espionage"). 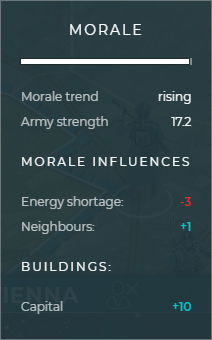 Hint: You can toggle the morale view in the game round settings on the top right to receive a quick overview about morale levels in your provinces. You can always use Goldmark to instantly boost province morale (10% for 500 Goldmark). This in turn directly effects the province's productivity and reduces the risk of revolts. However, once raise, province morale will again fall at day change if the calculated maximum province morale is lower than the current one. If you conquer a province, you’ll receive the whole daily production of that province and a part of the tax income. Conquering a province will also reduce its morale to 25%, making revolts very likely. One notable exception to this rule is 're-conquering' provinces: As long as the new owner of a captured province does not increase its morale to more than 80%, the previous owner will have the chance to re-conquer the lost province. If the province had more than 80% morale under the previous owner, it will automatically recover up to 75% after being re-conquered. Otherwise, the above rule applies. The morale of all of your provinces is increased by 10%. You receive half of the countries money reserves. You receive the daily resource production from the captured province. Morale in all of their provinces is reduced by 20% morale. The maximum morale in all of his provinces is reduced by 40%.